ber of the international dairy judging team of 1908, sent from the State University to Chicago. He was also a member of the international judging team of 1909, and the American Royal judging team. Both boys are members of the Young Men Christian Association. Warren W. resides at home, and Thomas is deceased. Mrs. Culver was teacher of the first school in Boone, Nebraska, for one year, then returned to Hopkinton, Iowa, where she taught for five years; and then came to Albion in 1881, where she taught in the city schools until 1886. Mr. and Mrs. Culver have passed through all the trying experiences of the early pioneer, and are well and favorably known. One of the successful farmers of Wayne county, Nebraska, is Charles Maas, who has taken a foremost part in the upbuilding of his community, and has developed a fine estate, where he now resides. He was born in Germany in 1858, a son of Gottlieb and Minnie Maas, who emigrated to America in 1884 and came direct to Wayne county, where the father died in 1909. The mother is now living at Hoskins. In boyhood, Charles Maas helped his parents and attended the public school, and was reared to farm work. His parents had six children. In 1881, Mr. Maas left his home for America, having in view the purchase of land and the establishing of a home of his own. He sailed from Bremen to Baltimore, and soon afterward purchased his present home on section three, township twenty-five, range one, Wayne county, where he has since resided. He has brought his land to a high standard of productiveness And has erected a comfortable and modern residence, which is fitted with many conveniences. He carries on mixed farming, with special attention to the raising of stock, and his enterprise and thrift have been well rewarded in the results he has been able to obtain. He is regarded as one of the substantial and useful citizens of his neighborhood, and has always taken an active interest in educational matters and every measure tending to promote the general welfare and prosperity. In 1886, Mr. Maas was united in marriage with Miss Minnie Maas, daughter of Carl and Albertina Maas, a native of Germany. Eleven children have blessed this union, their names being: William, Frank, Emma, Henry, Lena, Martha, Lydia, Charley, Paul, deceased, and Eddie, one other was not named. The family are well known and have a host of friends. Among the early settlers of Stanton county, Nebraska, who have been largely instrumental in the growth and development of the agricultural interest of that region, may be mentioned the gentleman whose name heads this sketch. He has always been found ready to further the interests of the community, and has gained a wide and enviable reputation as a citizen and substantial farmer of the locality. He has a fine farm located on section three, township twenty-three, and also a pleasant home. Mr. Zander was born in this county in 1873, and is the son of Fred and Augusta Zander, who had come to this country from Germany some years previous. They came first to Wisconsin, but did not remain very long, soon after driving to Stanton county with a yoke of oxen, the trip occupying about six weeks. Here they took up the homestead where the subscriber now lives and built the log house where he was born. Mr. Zander grew up in the county, obtaining. his education in the common schools of the district. He is naturally acquainted with all the hardships, as well as the advantages of a pioneer's life. He can remember where it was not an uncommon sight to see deer and antelope where cultivated fields or fenced-in meadow can now be found. More than once he assisted the family in fighting the prairie fires which broke out during the dry season and threatened to destroy their little home. In 1897, Mr. Zander was united in marriage, to Miss Lula Morris, of Stanton. They have but one child, Oscar, who is still at home. Mr. Zander occupies a foremost place among the prosperous farmers of this section and is deservedly held in high esteem by his fellow citizens. Among the leading old settlers and public spirited citizens of Antelope county, Nebraska, the gentleman above mentioned deserves a prominent place. Mr. Goke is well known through-out the community in which he resides as an honest, upright and worthy citizen, and enjoys the respect and esteem of all with whom he has to do. Mr. Goke is a native of Germany, being born in the village of Haaren, province of Westphalia, on May 7, 1844; his wife, Katie (Spinner) Goke, was born in the same village, October 4, 1852. They were married in 1876, in Germany, the church where they were both baptized, and are now the parents of eight children living and two deceased. Their names are as follows: Katie, Joseph, who is married to Francis Thiel, they having four children; Gertrude; Conrad, died at the age of twenty; Mary; Lizzie; Anna; John, who was killed by lightning when he was sixteen; and his two younger brothers, Carl and William, were with him at the time, but they recovered from the shock. Cologne," and were sixteen days on the sea. After landing in New York, the family proceeded to West Point, Nebraska, where they worked out for three years to save enough money to take up a homestead. In 1887 they took a homestead claim in south half of southwest quarter, section eighteen, and north half of northwest quarter, section nineteen, township twenty-five, range eight, Antelope county, which has remained their residing place through the years, but he has bought two more "eighties" and now owns three hundred and twenty acres. The first house put up by our subject was a "soddy" in which they lived for five years and then built a substantial frame house, which remains the present home. Mr. Goke now owns three hundred and twenty acres of good land, and can now enjoy the fruits of his hard labor in former years. Mr. Goke is not content to sit idly by, and still looks after his land and farming interests. Mr. Goke with his family are strict adherents to the Catholic faith, and worship in the church of that denomination in the country two and a half miles from their home. Mr. Goke was in the army in is native land, serving in the Franco-Prussian war, in the artillery service, and participated in the battle of Sedan and Siege of Metz and Paris. Mr. Goke is a democrat in political affiliations. Alfred L. Brande, widely known as one of the leading business and professional men of Pierce county, is a gentleman of superior intelligence and integrity, and has gained the entire confidence and esteem of the people among whom he has resided during the past twenty years. He has held the office of postmaster of Pierce since 1897, and is prominent in political circles in his county and state. Mr. Brande first came to Nebraska in August, 1891, and a few weeks after bought the Pierce County Call, taking charge September 1. Established in 1877, the Call was the first newspaper published in the county. Mr. Braude increased the circulation to fourteen hundred copies, which was the record for the county. He has owned and edited the paper since first purchasing except for a period of eighteen months, during 1909 and 1910, when he leased it to Witten & Braude - the latter a younger brother. Our subject is a native of Troy, Minnesota, born August 27, 1867. In 1869 the family settled in Wapun, Wisconsin, remaining there four years, then going to Charles City, Iowa, and thence to Warren, Illinois, in which towns the elder Brande filled the pulpit of the Congregational church. In 1885 they went to Tipton, Iowa, and for many years the father was pastor of the Congregational church there. Our subject received his education in the public schools of the different towns in which they sojourned, finishing his studies in the Tipton high school, and later taking a course at the State University in Iowa City. During vacations he worked in printing offices and thus acquired a good knowledge of that work, which helped him in his later efforts. Rev. Alfred Brande, father of our subject, was a soldier in the civil war, and served for about four years. He is a man of high order of intelligence, broadminded, and one who did much to help his fellow men in every walk of life. A. L. Brande was married in Pierce, July 7, 1894, to Ida Inhelder, a native of Cass county, Nebraska. Her parents were early pioneers of that section. To them have been born two children, Grace and Winnifred, both charming young girls, and the family occupies a high position in the social affairs of their community. Mr. Brande is a member of the Masonic, Modern Woodmen and Pythian orders in Pierce. Politically he is a republican. Hans Sorensen, a successful farmer and stockman of Howard county, Nebraska, is owner of a fine estate consisting of four hundred and eighty acres of choice farming land, and is otherwise prosperous. He came to this region practically without means enough to buy a team of oxen with which to start farming, and by energy and thrift has become one of the solid and substantial men of the county, gaining also the high esteem and respect of his fellowmen by his honesty and loyalty to the best interests of his county and state. Mr. Sorensen is treasurer of school district number sixty-six. Mr. Sorensen was born in Denmark, on March 26, 1851, and is the fifth child of Soren and Karn (Larkins Daughter) Ericksen, who had a family of seven. The mother died in Denmark in 1867, and the balance of the family, except Hans, came to America about 1870. Two years later, he came over, locating at first in Chicago, and spent about one year in and near that city, then went to Michigan. He was married in Chicago on May 2, 1873, to Hannah Andersen, she being a native of his birthplace, and coming to America in the same year. Chris and Paul reside in the same neighborhood, and all are industrious and thrifty farmers, and the three form the only remaining members of the once large family. To Mr. and Mrs. Sorensen have been born six children, two coming to them in Michigan and the rest born in Howard county. They are named as follows: George, Minnie, Victor, Karn, Soren, and Herman, all married except Victor and Soren, and all making their home in Nebraska. The gentleman mentioned above is one of the sturdy sons of Germany who came to the new world with a brave heart to carve out a name for himself and establish a home in the wilderness, and well has he succeeded in his determination, now owning good property in the sonthwest [sic] quarter of section twenty, township twenty-seven, range two, in Pierce county. Peter Flemming was born in the village of Wisch, province of Holstein, Germany, then a province of Denmark, November 17, 1853, and is the son of Hans Flemming, who served five years in the Danish army. The mother, Anna Schutz in maidenhood, died in 1879. Mr. Flemming received his education in the fatherland, engaging in farm labor from the age of ten years. He served in the German army during the years of 1873 to 1877, inclusive, entering the army soon after the Franco-Prussian war. He remembers that war as well as those of 1864 and 1866. In 1880, he sailed from Hamburg, Germany, for the new world on the steamship "Wieland," and was on the water twenty-three days, during which time they encountered severe storms. 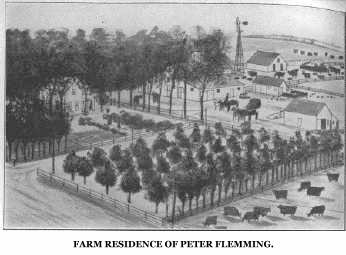 Upon landing in America Mr. Flemming came to Iowa, where he bought forty acres of land near Meriden, in Potawatamie county, and lived there some four years. He came to Pierce county, Nebraska, in 1884, buying railroad land in section twenty, township twenty-seven, range two, his present location, and this he has increased and improved until he now owns four hundred acres of as fine land as can be found in his part of the county. He has four acres set to trees. In 1912 he retired from active farming and purchased a residence in Osmond, where he can take life easy the rest of his days. Mr. Flemming has had discouragements along with his prosperity, and during the blizzard of 1888 lost all his cows and horses. He braved the blizzard for half an hour attempting to save his stock, but returned with his face and head covered with ice. Times were hard during the early years of settlement. They burned hay in the burners common in those days, and for a year or two burned corn. It sold for only seven and eight cents a bushel. Eggs were two cents per dozen, and butter two cents per pound. Hogs sold for only two dollars and twenty cents per hundred pounds after hauling twelve miles; in 1910 he got nearly sixty dollars for two hogs and hauled them only about five miles. Deer were about gone from the country at the time of his coming, but he remembers seeing one specimen at night. August 6, 1877, Mr. Flemming was married in the village of Wisch, to Miss Bertha Wiese, a native of Hoendorf, a neighboring village. She is a daughter of Hans Wiese. Mr. and Mrs. Flemming have seven children, whose names are as follows: Minnie, wife of Henry Miner; Anna, wife of Gus Weindrich; Celia, wife of Herman Kohler; Teresa, wife of Archibald Schneider; Augusta, Theodore and Henry. Mr. Flemming is of the German Lutheran faith, and is affiliated with the Modern Woodmen lodge. He is independent in politics, always casting his vote for the best man. We show a view of Mr. Flemming's farm residence, nestled in a grove of fine trees, planted by his own hand. An orchard of about three acres adds to the value of the farm. Farm Residence of Peter Flemming. The well regulated farms of Frenchtown precinct contribute largely to the wealth of Antelope county, Nebraska. The gentleman whose name introduces this review, is proprietor of a fine estate in section twenty-six, township twenty-six, range eight. He is one of the substantial and highly esteemed citizens of his locality, and has aided materially in its growth and development, building up for himself a substantial home and fortune by his perseverance and thrift. Mr. Switzer was born September 28, 1846, and is a native of Elgin, Kane county, Illinois. He had one brother, J. L. Switzer, who served in the civil war, enlisting in Company G, one Hundred and Forty-first Illinois Volunteers, and served in 1864 for one hundred days. Our subject's father, M. J. C. Switzer, was born in 1815, in New Jersey, and died January 25, 1893, of Irish descent, his grandfather having come from Ireland. On January 23, 1878, Mr. Switzer was married to Miss Martha E. Hemenway, and Mr. and Mrs. Switzer are the parents of the following named children: Olive; Grace, who died in infancy; Arthur, Clarence, Edgar, Ralph, Ora, Amos, Lyle, and Lloyd. Mrs. Switzer was born February 5, 1858.
pine and cedar trees. The farm is known as "Cedar Lawn." Mr. Switzer is well known as a stock raiser and general farmer, and he and his family are highly esteemed and respected by the community in which they live, and they have a host of warm personal friends and neighbors. Mr. Switzer devotes a good deal of attention to fine stock. He has on hand about fifty head of fine Polled Durham cattle, also about thirty head of horses consisting of draft and harness horses, in which he takes great pride. A picture of his place appears on another page of this volume. "Cedar Lawn Stock farm," Residence of V. M. Switzer. Joseph P. Braden has one of the best equipped farms in central Nebraska, and is a self-made man, interested in the welfare of his county and state. He has been prominent in political circles and has held various offices of honor and trust. He has been an influential factor in the moral, educational, and social life of Valley county, and is well known as an upright, progressive citizen. Mr. Braden was born in Lee county, Iowa, February 25, 1851, fourth of the seven children born to David and Sarah Jane (Taylor) Braden, who had seven sons. He was born and reared on a farm and has spent his entire life in agricultural operations. Both parents died in Iowa, the mother. November 21, 1858, and the father October 12, 1898. But two of their sons now survive besides Joseph P. Two of his brothers came to Valley county some time after 1883, John T., and William H., and the latter is the only one of the family now a resident of Nebraska, besides the subject of this sketch. Mr. Braden lived on the home farm with his father until the time of his marriage and there received the usual common school education. He was married September 14, 1876, to Lizzie Etta Pease, daughter of Jonathan L. and Sarah J. (Herren) Pease. After marriage the young couple located on his farm in Lee county, and in February, 1883, moved to Hamilton county, Nebraska, with their one child. They lived on a rented farm there until March, 1885, when the family removed to Valley county and located on two hundred and forty acres of school land which Mr. Braden purchased on section thirty-six, township seventeen, range fifteen, Yale township, which has since been the home place, although he has added to his holding. He is one of the most prominent farmers and stockmen of his part of the state, where he was one of the earliest settlers, being one of the few who persevered through adverse circumstances of pioneer life and remained on their original locations. He is active in the development of Valley and the adjoining county, now being the owner of seven hundred and eighty acres of choice land in Valley county. He was a member of the county board for nine years and in the fall of 1901 was the nominee of the fusion party for the office of county treasurer. Four of the five children born to Mr. Braden and wife are now surviving, namely: James Albert, farming in Yale township, is married and has one child; Dora, wife of Homer Hagermeyer, living on a farm adjoining her father's on the northeast, has two children; Charles Patterson, and David J., at home. The mother of these children died on the home farm in November, 1900. On December 16, 1902, Mr. Braden was married, at Mitchell, Nebraska, to Ada Logan, daughter of Hugh and Catherine (McFarland) Logan, one of ten children. She has three brothers and one sister living in Nebraska and five of the children are living elsewhere. Her parents are deceased. He and his wife have a comfortable home and are surrounded by every possible comfort. James A. Braden, son of Joseph P. and Lizzie (Pease) Braden, was born in Iowa, June 30, 1877, and was married at Ord, Nebraska, August 29, 1900, to Miss Maud Brown. He is a young man of ambition and industry and successful as a farmer. He lives on the southeast quarter of section twenty-three, of Yale township. He and his wife have one child, Gertrude. Mr. Braden was a member of the Presbyterian church in Iowa. In politics he is a populist, is a member of the Modern Woodmen of America, of which Mrs. Braden has taken the auxiliary degree of the Royal Neighbors. Mr. Braden lived in a sod front dugout for a short time on first coming to Nebraska, so knows what real pioneer life is like, having during those days seen a few deer and antelope running at large. During the year of drought, 1894, Mr. Braden raised nothing, not even enough to re-seed. The gentleman above mentioned is one of the oldest settlers in Madison county, Nebraska, and since locating here in 1876, he has taken a prominent place in the work of developing the region. He is the owner of a fine property in Shell Creek township, and himself and family are held in high esteem as worthy citizens and good neighbors. Mr. Johnson is a son of John and Tala Johnson, natives of Norway, where our subject was born September 9, 1868. John Johnson was born in the western part of Norway, and on reaching the required age, was drafted as a soldier, serving the customary time. L. S. was the third, child in the family, the others being Ole, Mons, Lauris S., Martha and Gustave. New York City. They immediately set out for the west, arriving in Madison county, Nebraska, in the month of April. They set about making a home, taking a homestead on section twenty-two, township twenty-one, range four, on which they built a sod house, which remained their dwelling for several years. They all worked together in an effort to establish a farm and accumulate a competency, and while they succeeded to a considerable extent, they, like every one else in those days, met with frequent losses by reason of unfavorable weather conditions, such as the dreadful hot winds which destroyed crops, etc., hail storms, grasshopper raids and other calamities. Their living was made largely from the hunting of wild game, deer and antelope being plentiful during the early years of their residence in the region. For fuel they burned corn stalks and often were obliged to use hay for a fire, especially when their fund of cash grew low and they were afraid to spend it for anything but the utmost necessaries of life. Our subject settled on his homestead in 1876, and in 1890 was married to Miss Anna Lee, a native of Norway. They are the parents of ten children, namely: Tena, Joseph, Andrena, Johanna, Henry, Lenore, Casper, Minerva, deceased; Ruth and Mildred. Erwin W. Goodrich, of Sargent, is a large landholder in Custer county, and has been successful as a grain and stock farmer. He is one of the early settlers of the county, where in early days he met the usual vicissitudes and trials of pioneer existence. He was born in Winnebago county, Illinois, February 29, 1856, next to the eldest of the four children of Julius L. and Olive (Conklin) Goodrich. Only two of the children survive, he and his sister, Mrs. E. E. McCray, a teacher in Loup City schools. The father was born in Vermont, of Welsh descent, settled on a homestead in Custer county in 1878, and died there in March, 1903. The mother, a native of Syracuse, New York, now lives in Loup City, Nebraska. Mr. Goodrich grew to manhood on a farm in Illinois, receiving his education in local schools and later engaging in farming. In the fall of 1878 he came to Custer county and took a timber claim of one hundred and sixty acres on section thirty, township twenty, range eighteen, and returned to Illinois. In the fall of 1880 he again came to Custer county and took up a homestead of one hundred and sixty acres adjoining his tree claim, and also pre-empted one hundred and thirty-five acres on the river. He soon began to prosper and has since added to his possessions and has made many improvements on his land. On April 4, 1888, in Taylor, Nebraska, Mr. Goodrich was united in marriage with Emily McGrew, born in Mercer county, Missouri, daughter of Kirby and Elza Ann (Mark) McGrew, natives of Ohio, who now live in Burwell, Nebraska. Mrs. Goodrich has a brother, Melvin, living in Burwell; a sister in Denver, and one in Des Moines, Iowa. Mr. and Mrs. Goodrich made their first home in the little sod house on the homestead. In early days Grand Island, one hundred miles distant, was their nearest trading point and market. Mr. Goodrich served as moderator and director of the school board of district number one hundred and forty-five and aided all measure's for the furthering of the best interests of the community. He is a successful farmer and owns eleven hundred acres of land which is devoted to stock and grain farming. This includes his three original claims. He engaged quite extensively in the stock business. Five children were born to Mr. and Mrs. Goodrich: Arleigh H., Ruth G., Mary Elza, and Niel, at home, and one son who died in infancy, In the spring of 1911 the family moved to Sargent in order that the children might enjoy better educational advantages. Among the prosperous citizens of Cedar county, Nebraska, who form one of the connecting links with the past history of this state is the above named gentleman, who resides on a fine farm pleasantly located in section eight, township thirty-two, range three, east. Mr. Lawson was born in 1861, and is the son of Lars Laveson and Caroline (Nelson) Laveson, both natives of Denmark. He was united in marriage to Miss Laura Wiseman of Cedar county, Nebraska, in 1888. They are the parents of six children, Bertie, Carlin, Pearl, Ella, Effie and Mary. Mrs. Lawson's father was one of the earliest settlers of the west, and the story of his life and experiences is one which can not be duplicated in the history of its settlement. He was born in Harrison county, West Virginia, November 5, 1817. He was united in marriage in 1838 to Phoebe Ann Cross, at Parkersburg, West Virginia. The following year he came west with his family to Burlington, Iowa, where he remained for a number of years, afterwards going to Fort Des Moines, then on the frontier. He was a carpenter by trade and by the exercise of economy the family managed to save a little money, which they invested in some property at this place. In 1856, he left Des Moines for Sioux City, where he roofed the first house in the city with shingles. In 1857, he moved to Cedar county, Nebraska, and settled upon a piece of land under the Squatter Law, and it was here that the terrible series of misfortunes began. During the time Mr. Wiseman lived in Iowa, eight children had been born to him, two of whom died and were buried in that state. When he first came to Nebraska, he had five boys and one girl, one of the boys, Benjamin F. dying in 1859, the first death in Cedar county. The same year another son was born, making the number of children just the same as before. In 1863 the population of the entire county did not exceed two hundred and seventy-five, including about fifty citizens who had enlisted in the Nebraska cavalry, raised for the purpose of defending the frontier settlements against the Indians. The eldest son, John, was a member of this organization and was stationed at a considerable distance away from home. In 1862, the governor directed that a second company of cavalry be formed. Mr. Wiseman enlisted in Company I, as he believed that the government needed all possible help. He left his family in good condition and took a soldier's fare, when he was forty-five years old. For some time, Mr. Wiseman was stationed near by where he could hear from his family often, but in the summer, the whole regiment was ordered to Sully, Dakota. He received a furlough in order to visit his family before he left and upon telling them the news, they were all badly frightened, as the Indians there were in a state of unrest. He comforted them by telling them that another regiment would be sent at once to take the place of the one which was being removed, and they would be just as well protected as now. How true their forebodings were can be told by reading the following paragraphs. This was the last time Mr. Wiseman ever saw his five children. About thirty days after he left home, when the regiment was about two hundred miles away, on the twenty-third of July, 1863, the Yankton and Sioux Indians took to the warpath. They visited the home of Mr. Wiseman, and found the children there all alone, the mother having gone to Yankton to purchase some needed supplies. When the mother returned in the evening, she found the multiated [sic] bodies of her five children in the once happy pioneer home. It was eight days before the news reached the Fort and even then, at first it was not definitely known whose family it was. When Mr. Wiseman finally heard the report, he was guarding some horses about two miles away from the camp. About daylight he rode away from the camp on his sorrowful journey home, starting without anything to eat, and getting nothing until he reached Fort Randall, one hundred miles away. He traveled day and night stopping at the fort only long enough to get something to eat and rest his horse, and at about nine o'clock the second day reached Yankton, almost crazed. Here he found that his wife had waited almost a week for him, sick and almost insane, and had then started for Sioux City. Mr. Wiseman then went to St. James, awaiting word from his wife. Twenty-five days after the massacre of his children, he could bear the suspense no longer and started for Sioux City to search for his wife. Three days later, he met her on her way back to find him. She was almost insane from grief and sorrow, and it was almost a year before she could tell him of that terrible day's experience, Mr. Wiseman then took her back to Virginia where they remained one year. When he returned to Cedar county, he hired a man to guard his home. He naturally had an intense hatred for Indians after that time, and was known to have killed nine Indians with his own hand. When looking upon the peaceful, smiling landscape it is almost impossible to realize that such bloodshed, and terror and sorrow could have ever taken place within the memory of people now living. The gentleman whose life history is here presented is widely known as one of the oldest settlers and most influential citizens of Merrick county. Mr. Johnston was born in Indiana, September 2, 1860, and is the son of Alexander and Susan (Farington) Johnston. He was the youngest in a family of three children, having one brother in Galesburg, Illinois, and one sister, Mrs. George Ferris, residing in Merrick county. The father died in 1863, in Galesburg, Illinois, and the mother in February, 1909, in Central City, Nebraska. In 1860 the family moved to Galesburg, Illinois, where Mr. Johnston, subject of this sketch, received his education, and later was employed in a dry-goods store in Galesburg four year's and came with his mother and family to Merrick, county, Nebraska, in 1879. Here Mr. Johnson purchased eighty acres of land on township fourteen, range seven, west, which is still his home place, known as "Fairview Ranch." On June 1, 1881, Mr. Johnston was married to Miss Myra A. Jewell of New York state, and later of Nebraska, and who was a teacher in Nebraska schools. She is from a pioneer family and came to Nebraska in 1871. Her father, C. C. Jewell, lives in New York state, and her mother is deceased, having died in 1895 in Nebraska. She has one brother residing in Akron, Ohio, and a sister who died in 1892. Mr. and Mrs. Johnston have had nine children born to them, eight of whom are living: Charles A., who resides at home; James N., married, has two children, twin boys, and lives in Merrick county; Robert W., resides at home; George A., is married and lives in Merrick county; Hattie M., deceased in 1897; Frank N., resides at home; Cecil J., also at home, as are Cora L., and Willie S.
school district number twenty-three, which office he has been filling for about fifteen years. Mr. and Mrs. Johnston are among the earlier settlers of the county, and have passed through all the trying experiences and hardships of frontier life. They are widely and favorably known. Among the leading old settlers and public spirited citizens of Knox county, Nebraska, the gentleman above mentioned deserves a foremost place. Mr. Johnson has aided in no slight degree in the development of the commercial resources of this region, and has always been interested in the welfare of his state and county. He resides in section thirty, township thirty-one, range four, where he has a pleasant home. Mr. Johnson is a native of Illinois, his birth occurring in the year of 1850, and he is the son of Joseph Johnson, a native of England, and Louisa Ann (Card) Johnson, a native of Germany. Our subject grew to young manhood in his native state, and then came to Woodbury county, Iowa, where he lived thirteen years. He came to Knox county, Nebraska, in 1875, and bought the James Abbott homestead, which he started at once to improve, and he now owns nine hundred and twenty acres of improved land, making one of the finest estates in this part of the county. As before stated, Mr. Johnson has always been interested in the welfare of his county and state, and has always done all in his power for the betterment of conditions, and his efforts have been so appreciated by the people that he was elected by his constituents to the office of deputy sheriff, which position he satisfactorily filled for six years. This fact goes to show the popularity and esteem Mr. Johnson enjoys in his community. In 1876 Mr. Johnson was united in marriage to Miss Mary Beverill, and to this union ten children have been born, whose names are as follows: Samuel Thomas, who died when two years old; Elmer T., Florence Elizabeth and Chester (twins), Mary E., Grace, Rolland, Dorothy E., Ruth and Bessie. Mr. and Mrs. Johnson and family are prominently known throughout the county, where our subject has resided for the past thirty-six years, and they are highly esteemed and respected by all with whom they have to do, and they enjoy the friendship of a wide circle of friends and acquaintances. In reviewing the history of Nance county, Nebraska, the citizens who have contributed largely to her welfare must be given special mention, and a prominent place among the number is accorded the gentleman above named. Mr. Dean is a pioneer settler and one of the best known, and most highly esteemed residents of that region. He is prosperous and has gained this success by the exercise of business tact supplemented by the strictest integrity of word and deed. William D. Dean was born on September 10, 1864, in Hunterdon county, New Jersey. He was the youngest child in Isaac and Elizabeth Dean's family of four, and grew to the age of six years in his native state, then the entire family moved to Illinois, settling in Rock Island county and remained there up to 1883, and then spent three years in Whiteside county, Illinois. They next emigrated to Nance county, Nebraska, joining a sister of William D., who had previously located here, arriving in the region on March 10, 1886. The sons, John N. and William D., rented a farm and went through hardships and discouragements during the first few years. Misfortune also overtook them in the death of the mother, on March 10, 1887, and the father died on January 8, 1893. William D. Dean rented land from the time he came to Nebraska, up to 1898, when he bought eighty-three acres where he has since continued to reside, with the exception of two years at Fullerton, from the fall of 1901 to the spring of 1904. This place is well improved and well equipped with substantial buildings and machinery for conducting a model grain and stock farm on a small scale. He has been very successful in his efforts, and while not the largest landowner in his locality, is progressive and known as one of the well-to-do men of his township. Mr. Dean was married in December, 1888, to Mary Elizabeth Turner, at the home of her brother, Samuel Turner, in Fullerton township, Nance county, Nebraska. They have two children, Clyde B. and Mazie Elizabeth, who are bright and interesting young people. Mr. Dean has two sisters, Mrs. Charles Copple and Mrs. James F. Downing, also one brother, J. N. Dean, all living in Nance county. Mr. Dean is active in local affairs, always standing for the best interests of his county and state. He is well known in the social life of his section, being a member of the Modern Woodmen of America, Royal Neighbors and Ancient Order of United Workmen lodges.